15 years ago when I was expecting my first child a work colleague gave me a recipe for a quiche. 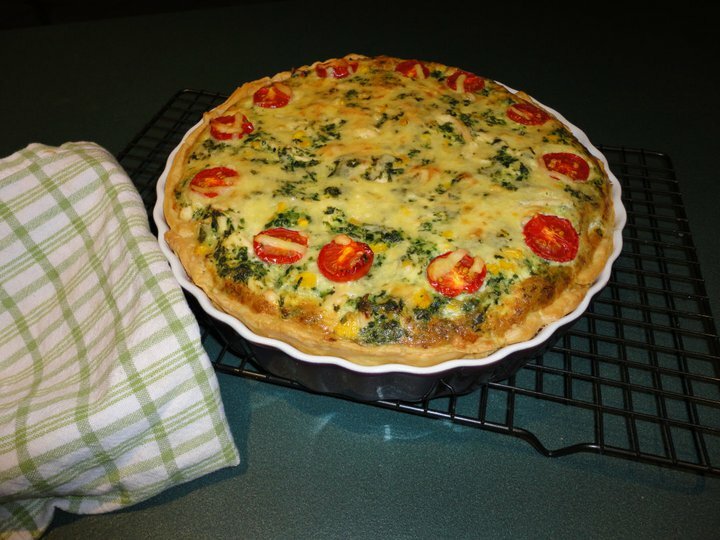 I must have made this quiche at LEAST 100 times over the years, it is simply beautiful and everyone loves it - best of all - it's so easy it is just ridiculous! 1 packet of frozen spinach (about 250g) defrosted in microwave for 4 minutes and drained of liquid. Preheat your oven to 180oC. (for my friends in the States/UK, that is about 350 Farenheit or gas mark 4). Grease your dish - you can use a large quiche dish, or I often make it in a huge flat rectangular dish. Line the dish with the puff pastry sheets, gently pressing all joins together and making sure you put it up the sides too. Mix all other ingredients together in a big bowl and pour into the pie shell. I usually then dot the top with whatever I have in the fridge - mini tomato, asparagus, sliced mushrooms, and another handful of grated cheese. Bake in the oven for 1 hour. The pastry will be brown and crisp and the quiche slightly brown and fat and full, and firm to the touch.